Employees of the New Museum in New York at a demonstration in the institution’s lobby on Friday, January 11. Photo: New Museum Union. 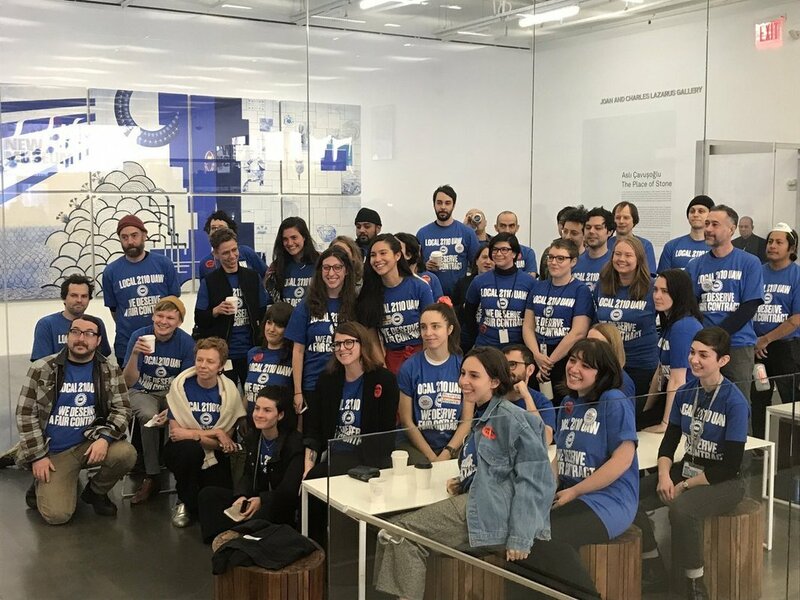 Earlier today, more than forty employees wearing T-shirts that read “We deserve a fair contract” gathered in the lobby of the New Museum in New York in a show of solidarity with their fellow colleagues who have taken steps to form a union. While the union’s organizing committee petitioned the National Labor Relations Board (NLRB) on Friday, January 4, to schedule an election, the group didn’t make its efforts public until Thursday, after museum management pushed back. Dana Kopel, a member of the union’s organizing committee and a senior editor and publications coordinator at the museum, told Lauren Cavalli of Artforum that organizers wanted to give the institution time to consider and respond to their decision to unionize. In an email sent to management on Friday, they asked the museum not to interfere with their right to organize. Since then, they’ve been disappointed with the institution’s course of action. Kopel said that the institution is making it seem as if only a small group of radicals support the union. Several staffers have also suddenly been reclassified as supervisors by higher-ups, which is being perceived as a tactic to decrease the number of people eligible for the union’s bargaining unit of about seventy-four part-time and full-time employees. This group does not include museum securitywho, due to the current legal precedent, must form their own unionor maintenance workers, who didn’t show interest in joining. Alicia Graziano, an individual giving and membership associate at the museum, told Artforum that she was also let down by the museum’s response to the employees’ plan to unionize, but has been inspired by how the staff has come together and shown an “overwhelming amount of enthusiasm and support.” “By forming the union, we’re looking out for our fellow employees and thinking about our future colleagues who will be the ones to move the museum forward,” she said. The movement to unionize was kick-started a few months ago and emerged out of conversations that staff members had been having for some time. If they successfully establish NewMuU-UAW Local 2110, they hope to improve working conditions at the museum and to honor founding director Marcia Tucker’s wish to make the museum a “collaborative,” “self-critical,” and “transparent” organizational model. The next step in the unionization process will be for museum management to meet with a union representative for negotiations before an election can be held. Staffers have asked for one on January 17, but they said it will most likely be postponed. While they wait for a vote to be scheduled, ANHS will continue its anti-union campaign. Yet, Graziano seemed unfazed by this. The New Museum opted not to comment for this article.